In college, I began drawing realistic animal rubber stamps, which mushroomed into a real business with over 900 images. I offer wild and domestic animal images —specializing in purebred animals. The images are from my own drawings based on photos and personal observations of the animals in my line. The stamps are made of grey gum rubber with a backing cushion mounted on a sealed wood stamp molding mount. The stamp image is stamped permanently on the top of the mount block. I guarantee the quality of my stamps. If you are unhappy with your purchase for any reason, you may return it (with an explanation) for replacement or refund of the value of the stamp. They are priced from $3.00 for “miniatures”, $5.00 to $9.00 for the standard size stamps. Most are priced in the $6.50—$8.00 range. Texas state sales tax and shipping are additional. I also offer a wide range of typefaces for address stamps with animal image(s). Although my manufacturer process has changed and I can no longer make plates to add new images to my stamp line, I am still able to do custom work for single run stamps. Standard sizes range from 1-1/4” to 2” high by appropriate width depending on the image. The “miniatures” mentioned above are approximately 1” sq. stamps of some larger images throughout the image line. There is a separate listing of the mini’s on their own page, as well as their numbers appearing where the original image is listed (see the various categories). Ceramics became my focus in college in the 1960’s, graduating with an MFA (Master of Fine Arts) in 1971. A few years out of college other vocations took the forefront and ceramics held a back seat. After I retired in 2015, I had the opportunity to set up a studio for both the animal rubber stamps and pottery. I am working with cone 6 porcelain and high-fire (lead-free) glazes that I primarily formulate myself. My work is electric fired and is oven, microwave and dishwasher SAFE. Depending on the character of the intended piece, I use both wheel thrown and hand-built techniques. One of the hallmarks of my work is the use of Texas plant leaves, made into ceramic stamps, that I have gathered from around our ranch. Many of the Oaks, Fig, and Cedar are some of my favorite leaves. Pictured is of a small casserole using the Live Oak stamps and a blue-green glaze. 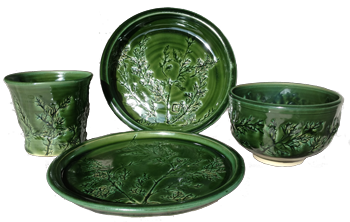 Another is a custom dinnerware order in dark green glaze with Cedar fond imprints. In addition to standard dinnerware, I enjoy making specialty items like tea caddies, microwave egg cookers, butter dishes, honey pots, sponge & spoon holders, or cookie stamps, among other things. Glaze colors range from white and greys through greens and blues to tan and iron reds and any combination thereof. My marketing is through local weekend markets, as I have no showroom at the ranch. My primary outlet is the Johnson City Market in Texas which is held the 4th full weekend of every month (March thru November). The hours of that market are 9-5 on Saturdays and 9-4 on Sundays (weather permitting). I do not sell pottery “on-line” as pieces are meant to be seen and handled in person. Each piece is distinctive and a personal choice for the buyer. I welcome your emails and would be happy to answer any questions you might have about both my ceramics and animal rubber stamps. 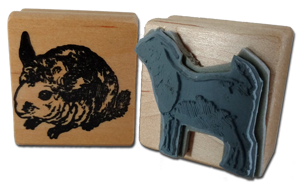 This animal rubber ink stamp and pottery site written, hosted, and maintained by HUEY Productions.